Kathy creates contemporary imagery saturated with color, layered with multiple marks, tangled with movement and intricately textured. Her work, upon closer inspection, reveals layers to be comprised of organic texture and abstracted natural forms. They convey a sense of flora and fauna, without the details of conventional painting techniques. 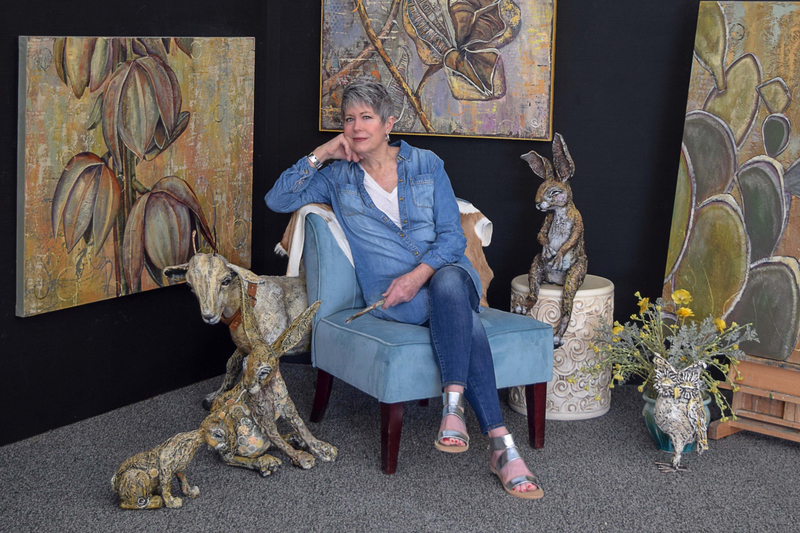 A self-taught artist, her work can be seen in public and private collections throughout the United States, Canada and Mexico. She signs her work with a Rocking Q, a brand used at one time on her father's ranch. The ever-present sphere and circle shapes in Kathy's current work represent the infinite connection between man and nature. I am intrigued by the feeling one gets when connecting with the world outside; when you open eyes and ears, close down a busy brain and shove out out the noise of hectic lifestyles. I want to convey the belief that we are intricately and infinitely laced with Mother Nature. My hope is to celebrate that relationship by visually wrapping you in her delightful arms for comfort, a whimsical moment or just a chance to catch your breath. Commissions are welcome. The opportunity to work with someone on a project specific to their home/office is a challenge I find intriguing.